Finding a well-written book about photography is not difficult, but it’s rare to find one like this Canon guide that also comes with an attractive and accessible layout. 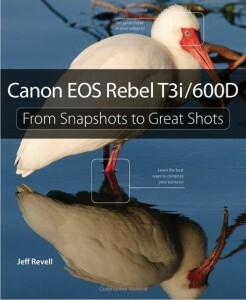 A great deal of the content in Canon EOS Rebel T3i/600D — From Snapshots to Great Shots is standard photography advice that can be found in the front sections of almost any similar how-to photography book. The main difference here is the focus on a specific camera, the Canon EOS Rebel T3i/600D. The camera-specific text is far more technical than what you’ll find in general guidebooks. Tips for improving your photography can be boiled down to a list of about five principles dealing with light, speed, and composition. Think of all the shipping costs we’d save if the author had condensed all the standard advice which you can find in a hundred other books. As I poked through the content in this book, I wondered, how many ways can you find to repeat the same tips and advice for novice and intermediate photographers before it gets old? What really caught my eye, (no pun intended) was the thoughtful layout and the modest but consistent use of typography. The designers makes good use of color in sub-headlines to help the reader navigate through the different sections. Other graphic elements in the book provide the reader with more information about the featured camera and how to use the controls to obtain the desired results.